Handcrafted by individually trained seamstresses in the USA since 1992. 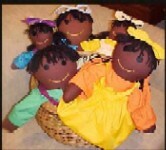 Sugarfoots are soft-sewn rag dolls created in the complexion shades of Cocoa, Ginger and Cinnamon. Sewn hair with four-ply worsted-wieght 100% premium acrylic yarn. Removable and washable clothing as well as the doll itself. Non-allergenic 100% pure polyester fiber doll filling, ensuring its original appearance after multiple washings.